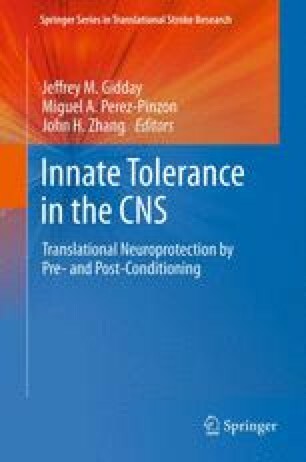 Preconditioning of the newborn brain can cause resistance to injury, and some of the mechanisms involved are similar to those described for the development of tolerance to injury in mature brain; however, there are also some mechanisms which appear to be distinct. Over the years, there have been a number of different types of preconditioning stimuli that have shown to protect against injury in the immature brain, and these include hyperthermia, anaesthetics, hypoxia and lipopolysaccharide exposure. Whilst these preconditioning paradigms have proven useful in animal models, the neuroprotective efficacy of preconditioning has not yet been examined in human infants. Delineating some of the common endogenous pathways involved in preconditioning of the immature brain could lead to major advances in the treatment of brain injuries occurring in newborns as well as adults.